Connecticut is a state in the northeastern part of the country that borders Massachusetts, Rhode Island, and New York. Although it is one of the smallest states, it has a population of over 3 million residents. People are drawn to the area, because of its blend of rural and urban neighborhoods, waterfront views, and delicious cuisine. Connecticut has something to offer everyone, from its small farms to its busy metropolitan areas. No matter what time of year it may be, the views are beautiful. Visit Connecticut. Whether you are planning a vacation or want to search for possible homes, you will want to have your own car with you. Auto shipping is the best option when you are planning a trip, temporary or permanent. At National Dispatch, we understand that a move can be challenging. Our Connecticut auto shipping services allow you to focus on other aspects of your move and have peace of mind knowing your car will arrive in a safe and timely manner. Research the area. Do your homework on the location to which you plan on moving to or visiting. Look up such things as: best time to move, weather and climate, best neighborhoods, and attractions. This information will help you in finding the best place for you and the best time to go to this area. In addition, it will help you know what to expect, so that you can properly prepare your car for the weather conditions. Understand your options. There are many auto shipping options available to you. How do you know which option is best for your car? When deciding on a carrier, most people choose to go with an open carrier. However, if you want more protection, an enclosed carrier is recommended, especially for luxury, classic, exotic, and sport cars. Choosing a shipping option depends on personal preference, budget, and time-frame. Prepare ahead of time. It is important to gather all necessary documents needed for transport before the driver’s arrival. In addition, be sure that you have removed all personal items from the car’s interior. Read more on preparing a car for shipping. The largest city in Connecticut, by population, is Bridgeport. Its population density is similar to that of Los Angeles, making it a relatively small city in area. Bridgeport is a diverse community filled with history and charm. Many of the buildings in the city have a colonial style. Less than an hour away, you will find Lake Compounce Theme Park, located in Bristol. It is home to Crocodile’s Cove, Connecticut’s largest waterpark, as well as Boulder Dash, the best wooden roller coaster in the world. New Haven is most known for being home to Yale University, a private Ivy League institution. This university also happens to be the third oldest institution in the country. Louis’ Lunch, a family-owned and operated restaurant, is recognized by the Library of Congress for creating the first hamburger. The restaurant has gained much recognition from the media, including the Travel Channel, Food Network, and Food and Wine Magazine. New Haven, Connecticut is not only known for being the birthplace of the hamburger. You will also find picturesque waterfront views and unique lighthouses. Learn more about New Haven. 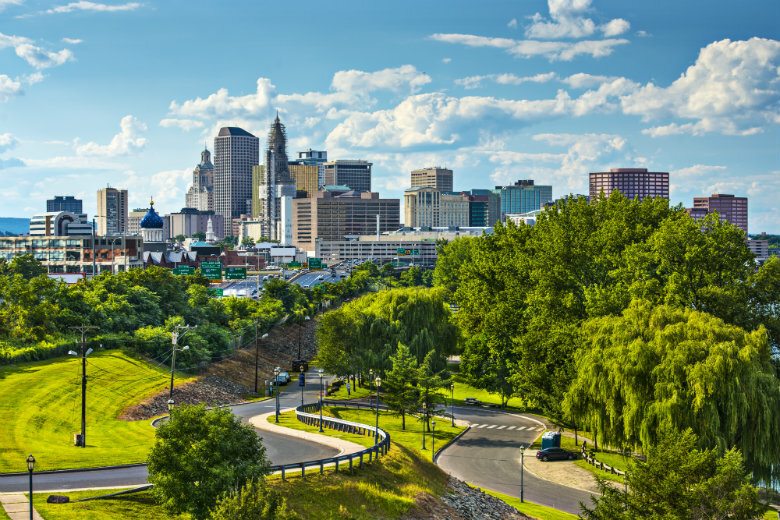 Hartford is Connecticut’s capital. It is also known as the insurance capital of the world because of the numerous large insurance companies located in the city. These companies provide thousands of jobs to its residents. The city is also one of the oldest cities. Its history and age can been seen in its architecture and buildings. Education is top notch, here. You will find Trinity College and the University of Connecticut schools of Law and Business. Like much of the rest of the state and the New England region, its scenery is beautiful, especially in the Fall when the leaves begin to change color. Making a weekend trip to New York City or Boston is not out of the question, because they are located just a short distance away. Stamford is considered the third largest city in Connecticut. It is part of the Greater New York metropolitan area. It is home to numerous large corporations. Specifically, four Fortune 500 Companies have their headquarters in the city. Nine Fortune 1000 Companies are located there, as well. Even, NBC Sports is located in Stamford. 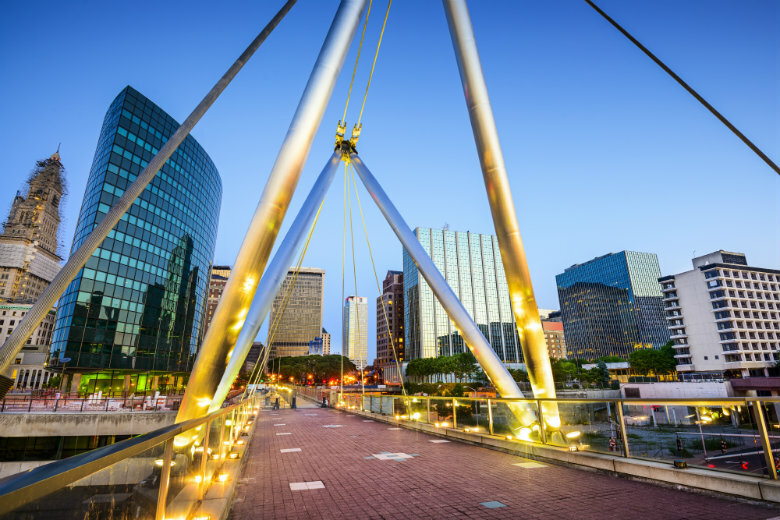 It is home to one of the largest concentrations of businesses in the country. The city is also home to the Stamford Waterside Design District, which is an interior design community. This community is also a popular shopping destination. Waterbury is the fifth largest city in Connecticut and ninth in New England. The city used to be a leading manufacturer of brassware. This is how Waterbury got its nickname as the “Brass City”. It is also how its motto was derived. The city is home to Post University and the regional campuses of many other institutions, including University of Connecticut, University of Bridgeport, Western Connecticut State University, and Naugatuck Valley Community College. Waterbury has a historic charm because of its past. Due to the many universities in the area, it also offers many amenities catered to college students. Whether you are planning a short vacation or organizing a permanent relocation, we can assist you with your travel plans. We offer auto shipping services to and from Connecticut. Therefore, once your visit has come to an end, you can rely on us to ship your vehicle back home safely. Request a free, instant car shipping quote by using our quote calculator. No personal information is required. You can also reach us at 800-321-2051.